As Christmas approaches, children in Iceland turn their thoughts towards the Yule Lads who will begin visiting their homes thirteen days before the Yuletide. 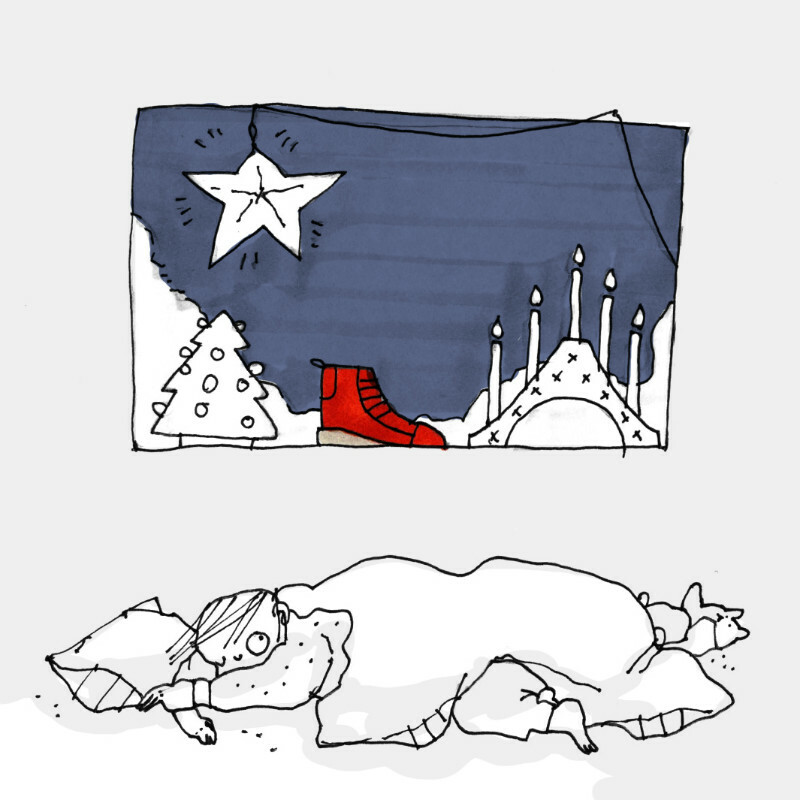 Every night during this period, the kids will put their shoes in the window in the hope that the Yule Lads – one of whom visits per night – will leave them a treat but only if they’ve been good, otherwise they might find a rotten potato waiting for them the next morning. 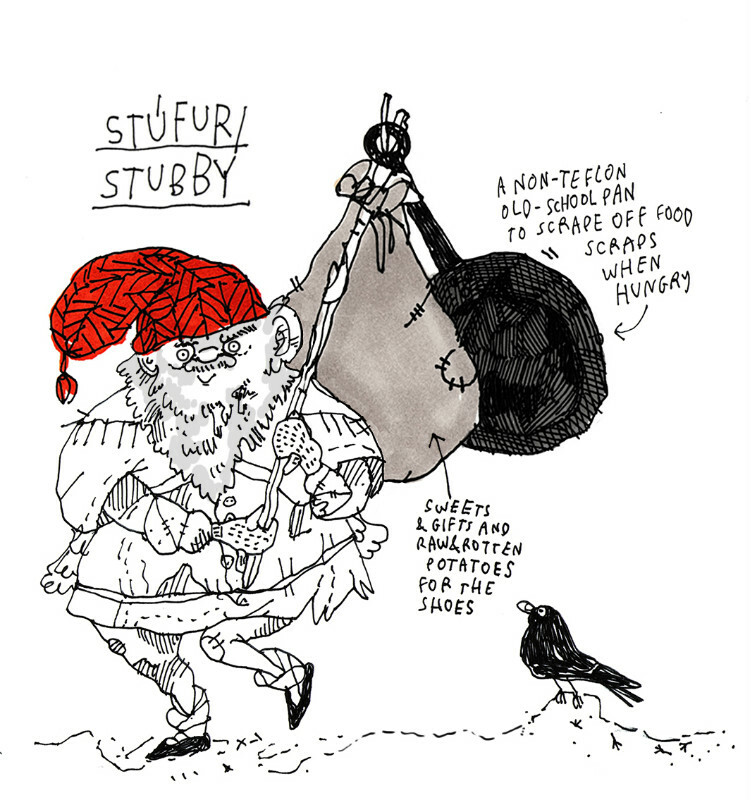 The story goes that the mischievous Yule Lads would creep down from the mountains in search of food. Each one has his own distinctive character and name to go with it, going from the more obvious nicknames such as Spoon Licker and Pot Scraper to some more obscure ones: from Stubby who gets his name from the fact he’s abnormally short with a tendency to steel away the dirty plans so he can lick the crust off them (pictured), to Doorway Sniffer who has an unusually large nose so he can discover behind which door the food stash is hidden. These thirteen troll-like characters are not so much akin to the seven dwarfs as to a gang of pranksters who are to be feared rather than cherished. Historically this was the case, when Icelandic folklore is filled with stories of children being eaten by the mean spirited guys (who’s to blame a mountain dwelling bunch with grumbling bellies, hey?! ), though as time has progressed their characters have softened and now it’s only the scary black Yule Cat that hangs around with them that might eat you if you’ve not managed to get new clothes for Christmas. And then there’s the cackling evil ogress Grýla (the mother of this merry band of lads) who is another character that scares the young ones; even to this day, she is still rumoured to have a tendency to turn nasty on Icelandic children if they haven’t been good. On the thirteenth night comes what maybe is the kids’ favourite Candle Beggar (who gets his name from the old days when candles made of animal fat could be a tasty snack for him), or is this their favourite because his arrival means one thing: when they wake up, Christmas Eve has arrived and at precisely 6pm that day – as per the Icelandic tradition – the festivities can start and the presents can be unwrapped! Another place to seek out the insider info of these cheeky pranksters, is a special radio programme (presented on BBC Radio 3 by Gerður Kristný, which features Icelander Clara who lives in London) which aired this weekend and you can currently listen-to online here. 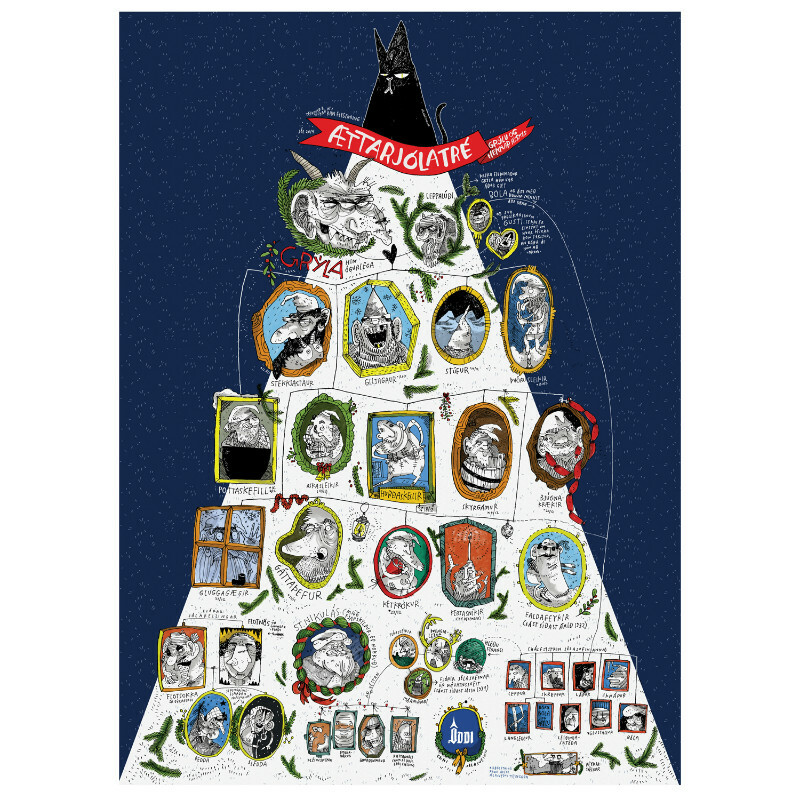 And to get a sneak peek of all the thirteen Yule Lads together, here’s a Christmas tree filled with them, and their cat, that Rán made earlier (this was made into a poster for Oddi).